This soft bag is designed for easier carry and better protection of your clarinet/oboe hard case. Adopts for durable Oxford cloth, wear resistant and water resistant. The sponge padding and soft inner surface can avoid scratch and impact effectively. Top carry handles and shoulder strap design for easier transport. 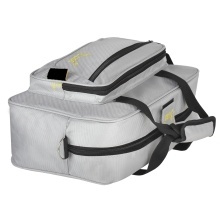 With three exterior pocket for storing music or other accessories.